Alright guys, this is not an investment scam. It has nothing to do with insurance, funds or bonds. A follow-up post to our "there is a free lunch" lifehack, we present to you Lifehacksg#11 - getting a guaranteed 6.67% return on investment. Standard Chartered Bank recently launched a new consumer product called the Bonus$aver account. Now there is a bunch of further details about how it works and benefits you (ie. 1.88% on up to $25,000 of your savings if you charge >$500 to your Bonus$aver credit card monthly, they are giving you a gold ingot for a deposit of more than $50,000 etc...), but Lifehacksg wants you to turn your focus away from all that hoo-hah and look at one specific feature. By setting up and depositing any amount* into the account today, the bank is giving you $100. Yes, $100 into the credit card for any expenditure at all. Let's take a look at the * fine print - the reason why they define it as "any amount" is because until the end of June, they have waived the requirement for a minimum daily balance of $3000. Now let's assume that you have to keep the minimum balance of $3000 in your Bonus$aver account. Ultimately, what you're getting is a $100 "interest return" for depositing $3000 with them. Furthermore, because you can close the account 6 months later, you're effectively locking up $3000 for a $3100 return - bringing your total annualized risk-free R.O.I. 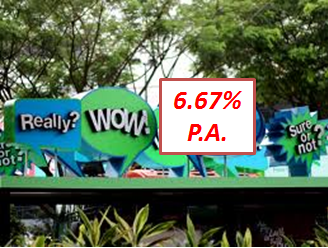 to 6.67%. Now, if you're only so kind to spread the word around with your friends by sharing this page!